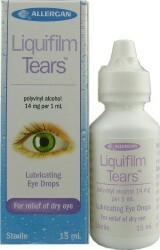 Liquifilm Forte Eye drops provide soothing relief from dry eye symptoms. One drop in each eye as needed. If irritation persists or increases, discontinue use. Keep container tightly closed. Do not touch tip to any surface since this may contaminate the solution. Discard unused portion after 30 days.